You may have heard about the toxic and potentially fatal effects of Xylitol when ingested by dogs. Most of the articles I have seen revolve around the fact that some manufacturers of peanut butter have started adding Xylitol as a sweetening agent. 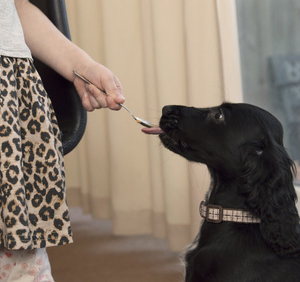 This is very significant, as many pet owners give their dogs peanut butter. I’ve used it for years as a treat, or as a way to hide pills to make it easier on me, and more fun for my dog when I have to give medication or supplements. The FDA has even issued a consumer warning entitled, “Xylitol and Your Dog: Danger, Paws Off,” which warns that xylitol can be fatal to dogs. The substance is quickly absorbed into their bloodstreams, and triggers a sudden release of insulin from their pancreases which causes their blood sugar levels to drop to dangerously low levels. This can occur within as few as 10 to 60 minutes after consumption, and can become fatal if it is not treated right away. Even a few pieces of gum are enough to poison a large dog. What you may not have heard, is just how prevalent Xylitol is becoming in human foods. Our list below has 17 common items that your dog could get into which would be really, really bad news. Now I’m not saying you would feed all these items to your dog, but some dogs are very creative in getting into cupboards or finding items on counters so it only makes sense to pay attention to these products. Xylitol is a sugar substitute which is being used more and more for its diabetic and dental benefits in people. But xylitol is highly toxic for dogs and many times can be fatal – even in very small doses. Xylitol is a natural sugar alcohol normally found in small amounts in many fruits and vegetables. Because of its sweet taste and plaque-fighting properties, it is frequently used as a sugar substitute and can be purchased in a granulated form for baking and as a sweetener for cereals and beverages. Nontoxic amounts are even found in some pet dental products. Due to its low glycemic index, it is also being sold in bulk to substitute for table sugar in baking and in-home use. Please – before you just read this list. Remember that this list is only some of the items and there is NO WAY anyone could list every brand which uses Xylitol now. That wouldn’t do any good anyway as a manufacturer may choose to include it as an ingredient tomorrow. If you get only one thing from this article, let it be this: Read the ingredients before giving your dog human food, and if there is any question or uncertainty, such as at a restaurant – don’t feed it to them! Super Sleep Soft Melts by Webber Natural (dissolvable tablets). Marketing words on products can sometimes actually be helpful! In this case, if you see a product that claims it is low in sugar, sugar free, or many other various terms, it may indicate that a product uses Xylitol as an ingredient. How can you tell if your dog has consumed xylitol? If you believe your dog has ingested xylitol, call your local veterinarian immediately. If left untreated, your dog can suffer liver damage and if not treated, it can be fatal. Always try to keep products or foods out of reach from your pet and make sure that medicine cabinet is closed securely.